When you BFF calls to tell you she’s engaged and your in charge of the bridal shower, you couldn’t be more excited! But then you realize that the pressure is on to make sure you throw her a bachelorette that she’ll never forget, am I right? But don’t worry, as it just so happens that we have almost everything you’ll need to throw the best hen party E.V.E.R!! Today we’re sharing our fave bride-to-be gifts, get her any (or all!) of these and they are bound to make her feel special in the lead up to the big day. 1. Eye Mask: You can’t plan a wedding without getting a decent amount of shut eye and anyone planning a wedding will know just how difficult that can be when your thinking of 101 things you still have to do before the big day. Not only are these sleep masks super punny, there soft and comfortable too, inviting you into a deep slumber every night! 2. MRS Iron On Letters: Personalisation is key! Snag some of these iron on letters and customize whatever you want! You can also get ‘I Do Crew’ ones too, great if your on a budget and need to customize more than one, for the rest of the brides squad! 3. Printable Wedding Planner & Organiser: Help you’r BFF plan her wedding and keep organised with this printable wedding planner and organiser. Specifically designed for managing DIY projects, this planner helps the bride-to-be keep track of all of her tasks, like how many, what materials she’ll need, how long each one is going to take and whether or not she’ll need to delegate some tasks to her wedding party. If you ask us, this is the perfect planning tool. 4. Bridal Babe T-shirt: Make sure everyone knows she’s a bride-to-be with this statement tee! It’s got so much colour it’s sure to make your BFF stand out in a crowd. 5. Wifey & Hubby Vinyl Stickers: Tea and coffee is going to be your BFF’s new best friend whilst she’s planning her wedding. So keep her topped up in style with these wifey and hubby stickers. 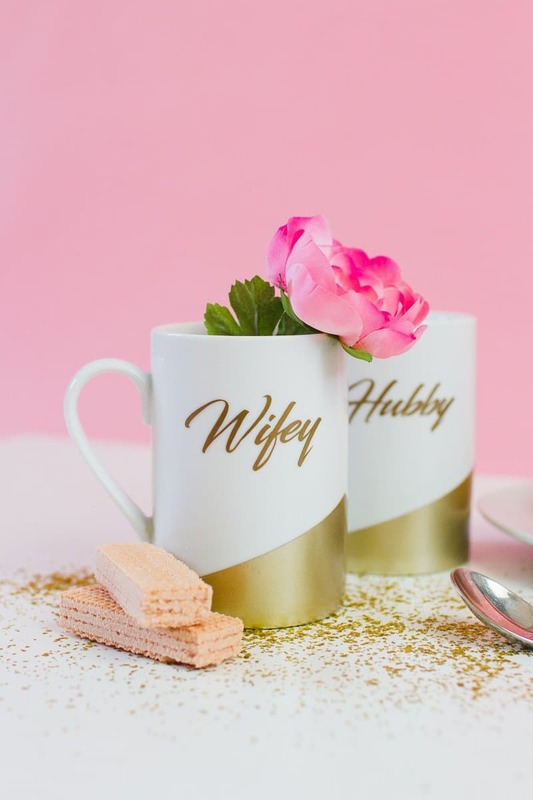 They’re a perfect way to customize her favourite mug and make a great gift for a newly engaged or married couple which is a bonus! Are you planning a bridal shower? Which one will you be giving to your bride-to-be? For more inspo head on over to Pinterest where we have tons more ideas for your bride squad.